modified Schumaker rudder on Ericson 35. Oh man, do we do rudders! 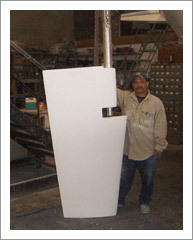 FinCo Fabrication creates rudders for all boats. 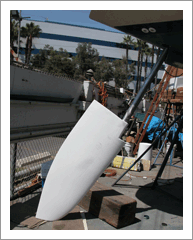 We have a strategic alliance with Foss Foam who pioneered modern rudder manufacturing. We have many of the original molds and tooling for production boats in our inventory and can replace damaged rudders with the exact factory replacement as originally provided by Cal, Santana/Schock, Ranger, Ericson, Islander, Columbia and many more. The original rudders originally were and are now manufactured using what has become known as the "clam-shell" method and our exact replacements use the same tooling and fundimentally the same technique with the following changes: over the years there have been advances in glass cloth and in laminating resins making them stronger and more reliable. We use these modern materials. We also laminate glass tape to the seams so that Finco rudders will last even longer than the originals. Please visit the Rudder Manufacturing page to see in detail how they are built. The clam-shell method has proven to be strong and reliable; the majority of original rudders are still in use on production boats over 30 years old. More rudder bearings have been replaced than actual rudders and if your boats needs new bearings, we can do that too! In addition to replacement with OEM original equipment, Finco offers updated profiles and sections. These newer designs won't make your boat actually go faster, but are designed to improve handling and directional control. This is most important when sailing very fast and can help prevent broaching and spin-outs. 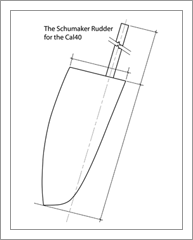 One of our most popular upgrades is the Schumaker rudder designed by Carl Schumaker for the Cal 40. This basic design has proven to be a very popular replacement on boats ranging from 32 to 45-feet LOA. If you own a broach coach you might consider a new "Schumaker" rudder even if your current one is still in good condition. Most boats can use upgraded rudders without incurring a rating penalty. Some local PHRF boards will hit some designs with a 3 seconds-per-mile penalty so you should check with your local board before making your change.